The Government of Ontario is looking for ways to improve unemployment rates among people with disabilities. Current statistics indicate that Ontario’s average is two times that of national and provincial figures. To address this issue, the province has introduced an employment strategy to encourage businesses to hire at least one individual that self-identifies as having a disability. Today, 1 in 7 people are living with a disability and many of these individuals remain unemployed because of their physical and/or mental employment barriers. Despite being well-educated and highly motivated, these people are consistently denied employment from a young age. In a recent call for action, the Government of Ontario is requesting that businesses with 20+ employees commit to hiring workers with disabilities to tackle unemployment rates. To accommodate the government’s request, small and medium-sized businesses can access grants and loans to offset the cost of hiring and training new employees, including workers with disabilities. Ontario government funding makes it easier for businesses to create new jobs and invest in workforce development initiatives. Disabilities come in many forms, including physical or mental ailments related to mobility, sight, hearing, learning, dexterity, pain, development, and psychological disorders. Over 15% of Ontario’s population identifies as fitting one or more of those categories. Hiring an individual with a disability may seem like a risk to some business owners, however, employers are forgetting to see the ‘able’ within the word disabled. Statistics Canada recently reported that the unemployment rate for people with disabilities in Ontario is more than double the national average. To address this issue, the government is asking all businesses with more than 20 employees to hire at least one additional person with a disability. If successful, the strategy could create 56,000 new jobs and reduce the number of unemployed Ontarians with a disability by 30%. Option 2: Access up to $20,000 to offset salary and specialized training of employees for up to 12 weeks OR up to 90% coverage assistive devices, specialized training, and assessments to a maximum of $3,000 per application. Interested businesses may contact Mentor Works to learn more about either of these hiring grants and determine whether their business is eligible to apply for government funding. The Canada-Ontario Job Grant also provides training grants to help employers invest in workforce development initiatives. This program is available for both training to assist employees with disabilities and to improve the employability of a business’ workforce. Eligible businesses can access Ontario government funding to enhance their labour force by upskilling and educating new/existing employees. Ontario small business grants can be used to offset third-party training programs that lead to operational and productivity improvements. Eligible employers can access up to 50%-83% of eligible training costs to a maximum $10,000 in Ontario government grants per trainee. To get started with COJG, businesses must submit an application package that includes a company overview, detailed training plans, training impacts, and vendor quotes. Within the application, businesses must identify all trainees by name and how the training will impact their role within the company. Typically, applications are reviewed and approved within 2-4 weeks. Business grants and loans help accelerate the growth and development of companies across Ontario. 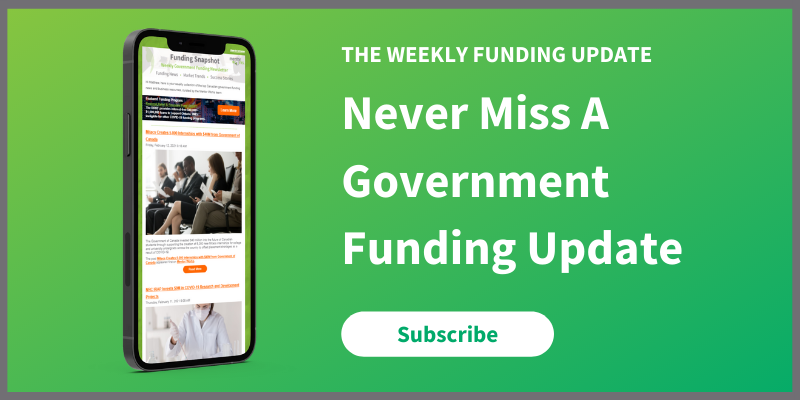 By staying up-to-date on current government funding programs, businesses can ensure they never miss an opportunity to leverage funding for their strategic projects. The support mentioned in this article is for employers to hire workers with a self-identified disability. If you mention this program to potential employers, they can apply for funding and hire you. This can give you an advantage over other candidates. I live in British Columbia, and want to start a not-for-profit business that exclusively hires deaf and disabled people to help ease them into the working world. I am not disabled myself. Is there any funding/grants available to help me start this business? I am having a hard time in my research, as most grants are for disabled people starting a business. Hi Jessica, while there is limited funding available to help start a non-profit, there may be potential for you to access funding specifically for hiring people with disabilities once the organization is running. Until you’ve become a registered non-profit and are ready to hire an employee, it will be difficult to secure government-based funding programs. HI Jeff, Thanks for your reply. Would it be better to register as a for-profit business? Would you be able to point me in the right direction to apply for this funding? Hi Jessica, While there is funding for non-profit businesses, our organization focuses specifically on government funding programs for established for-profit businesses. Please structure your business the way it makes the most sense for you. Hi, that’s weird. I posted a question on here, but it seems to have disappeared. I was asking if a private members golf club that I’m working for, though a non-profit, could qualify for funding or a disability worker grant, since I qualify as disabled and they have made accommodations to keep me on. Hi LC, unfortunately government funding is not available to support current employees such as yourself. These incentives are designed to help employers overcome barriers to employing people with disabilities and recruit new workers. Since you’re already on payroll, your employer is no longer eligible to receive funding. Is the funding finished for this year? I work at a group home for men with brain injury and have a young man that wants to start working. I also own a company that has a contract with a large company that has ladies clothing stores. I would love to hire him to help me but I was worried if he got hurt. Is there help for insurance coverage too? Hi Ken, unfortunately funding for that program is no longer available. We’re looking for towards the provincial government’s upcoming Fall Fiscal Update to release information on new and continued funding programs, so there may be a similar funding option available then. If you would like to discuss potential grants and loans to help you in other areas, please contact Mentor Works.